Above is a graphic based on FDA information and studies from Tufts University Center for the Study of Drug Development (CSDD). There are literally thousands of drugs studied before even one gets approved by the FDA (and other drug regulatory agencies in Europe, Japan, Canada, Australia, and numerous other countries). The whole process of pharmaceutical drug development can cost approximately US$2.6 billion (pdf), inclusive of the costs for all of the failures and the investments in that one successful drug. And the investment must be made without a firm understanding of how much can be earned, especially for drugs for rarer indications such as some cancers. Ironically, some alternative (meaning not really) medicine pushers think the difficulty and expense of getting a drug to market keep out their pseudoscience based medicine (pdf). My irony meter exploded, especially since we have a vaccine for whooping cough. It’s amusing to think about the conspiracy theory that the FDA (and every other regulatory agency in the world) is in the pocket of Big Pharma. If that were true, it’s a miserable failure when 87% of drugs that enter the FDA review process do not get approved. Apparently, Big Pharma isn’t paying enough (see Note 1). And that low approval process only includes drugs that get through the whole development process to make it to the application stage. Most don’t even get to that point. So let’s take a close look at each step of drug development to generally see how it’s done. This is essentially the first step of the whole drug development process. On average, it takes about 128 months (or over 10 years) from the moment a drug is synthesized until it receives regulatory approval. But before that drug is even synthesized, months or years of research is required to find a potential drug. Although some people think that, literally, Big Pharma tosses a bunch of different compounds into a petri dish and waits for a few days to see what works. Or, like I said above, toss a bunch of ingredients into a blender and feed it to rats to see if it works (see Note 2). First of all, there are years of basic science research that contribute to the very first step. It could be researched at public institutions like the National Institutes of Health, or universities across the world. Someone might publish a study that shows that a particular molecule on some kind of cell. Pharmaceutical researchers might take a look at that molecule, modify it in any number of ways, then see if it works on a different kind of cell. I’ve written an article where one pharmaceutical researcher looked over ancient Chinese texts to see if there were any potential treatments for malaria. She examined over 3000 possibilities to find one that worked – she actually did preclinical studies on many of those ancient Chinese remedies. Remember, this was a win for scientific research, not Traditional Chinese Medicine – nearly all of the remedies didn’t work or lacked biological plausibility for further study. Most of the basic pharmaceutical drug development isn’t based on random guesses. It’s based on what we know about biology. Once basic research provides a hint as to which way to go, or by random luck, a researcher discovers a compound that has superior potential effects on some medical condition, actual drug discovery begins. Although historical pharmaceutical drug development was basically sifting through libraries of chemical compounds and small molecules, including natural products or extracts, and then screening them in cell culture or whole organisms, modern drug discovery has become much more rapid and targeted. With human genetic information – along with the ability to quickly synthesize larger and more complex molecules – modern pharmacology employs high throughput screening of libraries of large bio-molecules against isolated biological targets which are hypothesized to be disease modifying. Like “reverse engineering,” this is sometimes known as reverse pharmacology or target-based drug discovery. Today, computers can design biological molecules that do an even better job than nature. Most of you know about penicillin, a basic antibiotic that was accidentally discovered by observations that bacteria were killed by the Penicillium mold. Of course, it’s probably not wise to eat a bunch of molds to treat a bacterial infection, so the active ingredient, penicillin was isolated. This spawned numerous new compounds that added to the original penicillin molecule. Some of the changes improved efficacy, targeted other types of bacteria, or even reduced bacterial resistance. Some of these new forms of penicillin were designed on a computer in a lab. Identification of molecules that pass through the initial screening. Optimization of those molecules to increase affinity, selectivity, efficacy, metabolic stability, and bioavailability. Many people think that it’s easy to find a drug from a plant – but unless the molecule is “fine-tuned” it may not work. Or it may be too expensive. Or it may be toxic. Getting to this point is essentially basic science, with teams of scientists working at the molecular and biochemical level just to get a potential drug. Like the story of the Chinese researcher looking for the malaria cure, it results in mostly dead-ends. In science, however, failure or dead ends, are often the evidence necessary to narrow down a potentially successful molecule. It’s how science works. Just so it’s clear, only one in 5000 compounds that are discovered at this point make it through clinical trials and gain FDA approval. This isn’t easy. Once a compound has been developed and hypothesized to have a strong clinical effect, the potential drug moves to what is called the pre-clinical stage. Pharmacodynamic data, that is, what the drug does to the body. Pharmacokinetic data, or, how the body metabolizes the drug. This research generally examines absorption, distribution, metabolism, and excretion (sometimes called ADME). Toxicity testing, generally in animals. This data is gathered from non-human research studies. Various “models” are used as stand-ins for humans – cell cultures (called in vitro) and various animals, mostly rats and mice (called in vivo). These types of studies cannot actually give us anything more than basic data, because these models are either biologically simplistic, like cell cultures, or non-human animals that are used as stand-ins for actual humans. Admittedly, researchers do attempt to mitigate the quality of these data by setting up the research study very carefully. Even if there are weaknesses to preclinical research, they are crucial to how the actual human clinical trials should be done. For example, safety profiles derived from the preclinical data are absolutely necessary to determine what the best dose may be. Again, a large number of proposed compounds fail to make it through pre-clinical studies. For example, a drug might be effective, but only at a dose that has some adverse effect such as high toxicity or unacceptable major side effects. But if a compound makes it through preclinical studies, by showing the effectiveness and a favorable toxicity profile, then it may be ready for clinical trials. On average, it takes around 31 months from the day a new compound is identified and enters pre-clinical studies until it is ready for the first stage of clinical trials. So out of the nearly 11 years, it takes for a drug to get to market, about one-quarter of the time involves preliminary research just to figure out if the drug should be used in humans. Let me remind the reader, once again, that this isn’t easy. Or for the faint of heart. Now we get to the most expensive, and time-consuming, a portion of the pharmaceutical drug development process – human clinical trials. Before a new drug can enter the clinical trial phases, it must actually get approval from the FDA to do so. The pharmaceutical company (called the “sponsor” in the regulatory language of clinical trials) has to submit an application called Investigational New Drug. The formal application, which is necessarily complex and detailed, is the process by which the sponsor (pharmaceutical company) obtains permission to ship an experimental drug to investigators before the New Drug Application is submitted. The IND contains all of the preclinical data gathered by the sponsor. It is then reviewed by the FDA (and almost every drug regulatory agency in the world) to determine if the drug is safe enough to assure that research subjects will not experience unreasonable risks. New indication, that is a new clinical use for an approved drug. For example, a drug could have been approved for disease A, but results show it’s also effective in treating disease M.
Change in the approved route of administration or dosage level. Change in the approved patient population, such as pediatric patients, or a population at greater or increased risk, such as elderly or immunocompromised patients. A significant change in the labeling of a drug, including changes in promotion or advertising. In some respects, the sponsor needs to begin clinical trials as if it were a new drug for many of these changes. However, since there’s probably already a wealth of data on safety, clinical studies on already approved drugs can be compressed, although this is not always the case, especially with new indications. Once the FDA approves the IND, the first of 3-4 phases of clinical trials may commence. Generally, all approved clinical trials, worldwide, must be listed in an official clinical trial database. If the trial isn’t listed there, it truly doesn’t exist legally or scientifically. The myth that these clinical trials are secretive and hidden from the rest of the scientific community is simply incorrect – we can search for any clinical trial anywhere in the world, uncovering all kinds of information. There’s one more issue that needs to be addressed. Clinical research requires Institutional Review Board (IRB) review and approval. The IRB, which represents the institution that houses the research, reviews and approves (or rejects) any proposal to do research on humans. They monitor this research from beginning to end. They reject any clinical research that is unethical or dangerous to humans. During Phase I trials, researchers test a new drug or treatment in a small group of people for the first time to evaluate its safety, determine a safe dosage range, and identify side effects. This is necessary before efficacy studies may begin. Subjects are generally given doses that are a fraction of what was used in pre-clinical in vivo studies. The primary goal of the Phase I trial is to gather dose-ranging data, although safety and effectiveness is also observed. The testing is done on a small group, usually 20-100 individuals, of healthy volunteers. The dosage is mostly sub-therapeutic, although the doses can be increased during the latter portion of these clinical trials. In addition, there’s generally no control group, nor is there any type of blinding (that is, neither the patient nor researcher knows whether a placebo or actual drug is given to the patient). Phase I studies are essentially very basic observations. And it focuses primarily on potential adverse effects. Test subjects are generally observed for a period of time after taking the medication under very controlled conditions. The subjects are often isolated in units where everything, including food consumption, is tightly controlled. The patients are constantly assessed for clinical changes (through typical diagnostic tests like EKGs and blood tests), along with behavioral and psychological observations. Although it may not be as commonplace as it once was, mostly medical and nursing students were recruited for these studies and were compensated for doing so. Today, most of these type of clinical trials are outsourced to contract research organizations (CRO), who recruit patients from the general population. Participating in these clinical trials can be a lucrative income stream for those individuals who are otherwise very healthy. After the completion of the Phase I trial, the sponsor then determines if it will proceed to Phase II clinical trials. This step is not a cursory one – careful examination of the results by the sponsor is necessary to support a move to the larger Phase II trial. And the FDA (or other regulatory agencies) are still a part of the process, even after approval of the IND that begins these trials. For example, the sponsor must report all life-threatening, serious, suspected and unexpected adverse events within a few days of the event. They must do so even if the sponsor states that they have no evidence that the drug under study caused the adverse event. In addition, the sponsor must provide an annual report of the clinical research which must include information about all aspects of the clinical research, including adverse events. On average, a Phase I clinical trial takes about 20 months to complete. About 40% of drugs that enter Phase I fail to move on to Phase II trials, mostly as a result of serious adverse events (see Note 3). The Phase II trial is the part of clinical trials where the drug or treatment is given to a larger group of participants to see if it is effective and to further evaluate the drug’s safety profile. Generally, at the start of Phase II trials, the researchers may not know if the drug has any efficacy in humans. There might be some preliminary information from in vivo studies with animal models, but at this point in the clinical trial, researchers generally don’t know if observations of effectiveness are applicable to humans. At this point of pharmaceutical drug development, researchers do not know if that the new drug has any therapeutic effect whatsoever. Researchers may have a good idea, but like all scientific research, the point is to either support or refute the hypothesis – does the drug work? A proper Phase II clinical trial includes from 100-300 patients using the predicted therapeutic dose, or range of doses since one of the bases of pharmaceutical drug development is that a drug follows a dose-response relationship – a higher dose should show a higher response. Phase II studies are designed to determine the overall effectiveness of the drug, but it also continues the Phase I safety assessments. Case series – demonstrating a drug’s safety and activity in a selected group of patients, who may have the clinical condition that will be treated by the drug. Randomized controlled trials – using a much smaller patient population than would be found with a Phase III trial, some patients receive the drug or device while others receive placebo or the standard treatment. Phase II trials are sometimes complicated by the fact that they are sometimes divided into Phase IIA and Phase IIB. Phase IIA is specifically designed to assess the proper dose, along with the response to that dose. Phase IIB is specifically designed to examine the efficacy at the proper dose. Although they seem similar, they are two different goals. Phase IIA just looks at whether there is a dose that gives some level of efficacy. Phase IIB determines how effective that dose actually is. Because of the small population size in the study, the results generally can only give broad information. For example, in a clinical trial for a new streptococcus vaccine, sponsored by Genocea Biosciences, failed in the Phase IIA trial. The study showed that the vaccine was effective, but, because of the small number of trial participants, it could not show a robust statistical difference between the control and vaccinated group. Of course, a larger study could have shown better statistical strength, but apparently, Genocea has limited resources, and it had to pick and choose where to invest those resources. Based on the weak data from the Phase IIA trial, the company decided to suspend their NDA. This happens a lot, which contradicts the belief that Big Pharma pushes ahead even though they don’t have data supporting the safety or efficacy of a drug. Generally, a Phase II trial takes around 30 months to complete. But at this stage, usually, around 64% of drugs fail during Phase II trials, mostly because of lack of effectiveness, although some adverse events that are related to the drug or device may be discovered. If you’re keeping track, only 21.1% of drugs that enter a Phase I trial make it through the Phase II trial. That’s a tough track record for success, more or less refuting the idea that Big Pharma has an unrestricted ability to push any drug onto the market. Phase III of the clinical trial process is often called a “pivotal” trial because it provides the best scientific evidence of the safety and effectiveness of a drug or device. The drug or treatment is given to a larger group of patients to confirm its effectiveness, monitor side effects, compare it to commonly used treatments, and collect information that will allow the drug or treatment to be used safely. This phase usually includes 1000-3000 patients in multiple centers, sometimes, in a variety of countries. Each center’s research is generally managed by a lead researcher who recruits patients. Normally, if ethical and practical, the type of study that is employed is a randomized, double-blind, clinical trial. The study population is divided roughly into two halves (though it can be more), one that receives a placebo or standard treatment, and another that receives the new drug. For proper blinding, neither the patient nor the research knows who is getting what. I’ve seen TV shows, like “House,” where a patient gets into clinical trials using nefarious techniques like blackmail or bribes or a caring boyfriend– it’s almost impossible to do this, mainly because the sponsor or pharmaceutical company blinds the medications, so even the lead researcher has little clue who is getting what (see Note 4). Moreover, if such manipulation is uncovered, it could invalidate the whole study and the researcher who tried to control who got what would be found in a serious ethical breach. But it does make for good TV, I suppose (see Note 5). The FDA and other regulatory agencies may require that two Phase III trials are done (either concurrently or consecutively) to get better data while avoiding biases and other issues. There is no regulation that forces the sponsor to do this, but it may be required by the FDA or other regulatory bodies, depending on various factors, such as a need for better safety or efficacy data in a larger population. 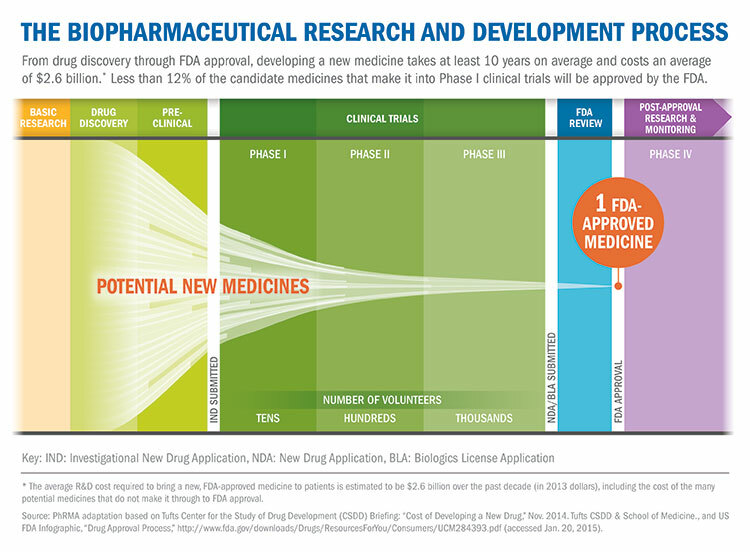 On average, a Phase III clinical trial takes about 31 months and about 62% of drugs make it through Phase III to the final stage, which is a New Drug Application (NDA) to the FDA (and other regulatory bodies). Again, if you’re keeping score, only 13% of drugs that entered Phase 1 trials, on average about 81 months or 6.5 years ago, have passed all of the clinical hurdles to finally arrive at the NDA phase. Some sponsors continue the Phase III trials during the NDA, so that novel, life-saving medications can be given to patients (often at no charge). Although in these cases, the research is no longer randomized or blinded, it still provides significant data on effectiveness and safety. The new drug application (NDA) represents the end-point of this process for drug development. The pharmaceutical company has discovered a potential new drug, tested it in various models, and gone through three (probably more) different clinical trials. The next step is to gain regulatory approval. Although I have focused on the US-centric FDA process, most countries have nearly equivalent regulations. And for most countries, there are often bilateral agreements to accept a regulatory finding from one country and apply it to another. But most countries require the same phases of clinical trials, similar documentation, and similar rigorous review. Is the drug safe and effective in its proposed use(s) when used as directed? Do the benefits of the drug outweigh the risks? Is the drug’s proposed labeling (package insert) appropriate, and what should it contain? Are the methods used in manufacturing the drug, called good manufacturing practice (GMP), and quality control sufficient to maintain the drug’s quality and to preserve the drug’s identity, strength, and purity? These answers are never one sentence long. Obviously, they are not yes/no answers, but are complex with hundreds of pages of supporting documents. Yes, that is one NDA. And yes, one reviewer has to read it thoroughly. Generally, the FDA sends back a letter to the sponsor with numerous questions and comments – everything from spelling errors to criticizing the interpretation of the data. Receiving this letter is a challenging time for the sponsor because the answers have to satisfy the reviewer and have to be done in a timely manner. Because the reviewer, after sending the questions to the sponsor, generally moves on to the next application. It may be a significant period of time before the researcher gets back to the application. I want to talk about one more item in the whole regulatory process that is beyond just the preclinical and clinical research. All pharmaceuticals, but especially biologicals like vaccines, also require a thorough and detailed plan about the full manufacturing of the drug, including a proposal for meeting GMP requirements. Before a drug can be marketed, it requires a thorough inspection by the FDA (and usually other regulatory agencies throughout the world). This isn’t a cursory inspection, but a multi-day review of everything from quality testing to documentation. The timeline for approval of an NDA varies depending on a lot of issues, including the complexity of the application and the number of questions asked by the FDA reviewer. Individuals in the regulatory departments of Big Pharma are often extremely experienced and are critical to writing an application that answers questions before they’re asked. On average, it takes about 16 months to get regulatory approval. And at this point, because most drugs have failed to reach this point in the process, having been unsuccessful in one of the three phases of clinical trials, thus the worst drugs have been weeded out. So, about 90% of NDAs get some form of FDA approval. Vaccines, although a drug, go through a separate approval process called Biologic License Applications (BLA), which covers biopharmaceuticals (or biologics) – pharmaceuticals, like vaccines, that are extracted from biological materials (most pharmaceuticals are synthesized). According to the FDA, vaccines require the same preclinical and clinical studies as any other pharmaceutical. However, the FDA (and other pharmaceutical regulatory authorities across the world) place additional regulatory requirements on vaccines such as lot-level tracking for safety, effectiveness, and quality. The FDA may also demand lots for its own independent testing. Finally, the FDA requires post-licensing clinical and epidemiological studies to continue to monitor vaccine safety and effectiveness. Despite the claims of the anti-vaccine world, clearly, vaccines are more closely monitored than other highly regulated drugs. Some drugs, that treat or prevent life-threatening diseases or fill some unmet medical need, may get an expedited or fast-track review from the FDA. As opposed to what many anti-vaccine people claim, fast-track reviews do not mean it’s any easier to get FDA approval. The same preclinical and clinical studies are required, the same review of the NDA and manufacturing are required, and the same approval process is required. The process is just sped up, giving priority to these novel drugs and vaccines that save lives (see Note 6). That may seem good, but remember only 11.8% of drugs that enter a Phase I clinical trial ever get approved by the FDA. It’s a marathon that self-selects for the safest and most effective drugs – once the drug reaches the NDA stage, all the hard work has been done. Frequently, if not always, the pharmaceutical companies will sponsor an additional phase of clinical trials. Called the Phase IV trial or post-marketing studies, these are done after the drug or treatment has been marketed (that is, gained regulatory approval) to gather information on the drug’s effect in various populations and any side effects associated with long-term use. These studies are done scientifically, usually in much larger clinical trials, and can uncover new safety issues, can be used to determine the drug’s interactions with other drugs, or can be tested in other patient groups, such as pediatrics or pregnant patients. Most research published, after the original clinical trials, are Phase IV studies. They are often funded by pharmaceutical companies, but in many cases, they are funded by governmental entities or grant providers. Phase IV study documentation and results still need to be provided to the FDA, and many times, issues are uncovered, like lower than predicted effectiveness or higher than expected or more serious adverse events, which cause the drug to be voluntarily removed from the market. Sometimes, the FDA, based on Phase IV data, requires a revision to the drug’s package insert to warn physicians about certain situations, like a previously unknown interaction with another drug or a food substance. A lot of the anti-vaccine world doesn’t understand the importance of Phase IV clinical trials. They are often published years after FDA approval but carry an incredible amount of weight both for the FDA and for evidence-based medicine. Drug development is a long process, taking, on average, 11 years from synthesizing a new drug until it’s approved for marketing by the FDA. It’s an arduous and complex process that weeds out ineffective or unsafe drugs pretty quickly. Clinical trials are three phase studies that start with identifying safety profiles and continue through examining the effectiveness of the drug. Of every 5000 compounds that may show early promise in drug discovery, only 1 will receive FDA approval. Only about 11.8% of drugs that enter the clinical trials eventually receive approval from the FDA. It costs over US$2.8 billion to bring one drug to market. Ignoring confirmation or selection bias, where one searches for the failures in this process, it is very effective in selecting for the most effective and safest drugs. Back to the alternative medicine writer who complains that it’s too hard to get some alternative drug approved – yes it is hard. It’s based on evidence and real data, and that’s how it should be. Only the best medicines, the ones that prolong human life and improve the quality of that life, should be approved. So those of you think that Big Pharma says “here’s a drug, get it approved FDA” ignores facts about the process to get drugs to the market. It’s not for amateurs or the impatient. It’s a long, complicated, challenging, and difficult process, which requires a large team of medical and regulatory experts managing the gigantic process. 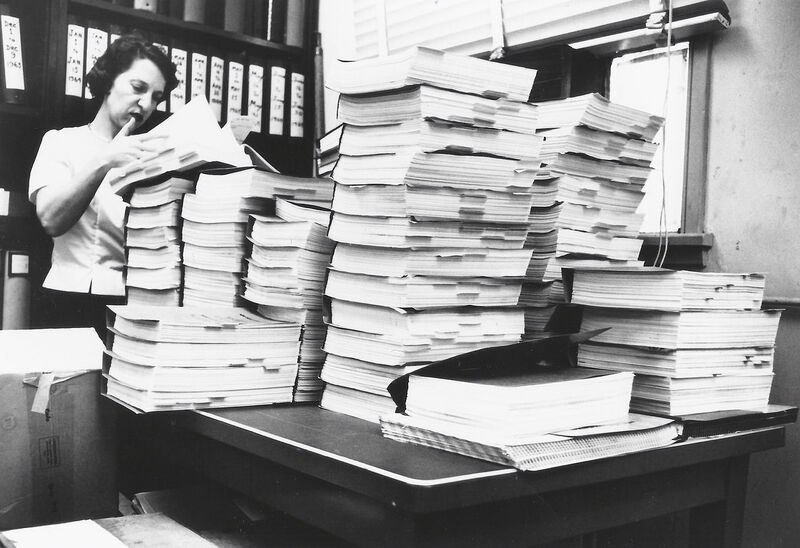 The vast majority of research stops before it gets to the approval process. And for those of you who think that vaccines find their way to the market without research, that’s ridiculous on so many levels. This was sarcasm, for those of you who don’t understand sarcasm. Though I make fun of using a blender in science, it is actually a very important piece of equipment in much of biomedical research. Typically, we used a “Waring blender” to pulverize cells to isolate a protein or organelle for further research. But almost everyone in biomedical research used one. Although most Phase I trials are safe, a large number do have minor to serious side effects. If you’re considering applying to one of those clinical trials, you should be aware that you could experience a serious issue, although you would be closely monitored by physicians and other researchers. Even though I linked to the database of clinical trials for every drug in the world, that doesn’t mean it’s an open source for you to get yourself or a loved one into that clinical trial. Phase III clinical trials have very specific inclusion criteria, and even if you the drug may help you, you may not be accepted into the trial. Furthermore, a trial in Kansas City may not want to include someone from Boston, because they want to closely monitor the patient. Sometimes it’s difficult to blind patients since the drug has an odor or some other cue that tells the physician which is the real drug and which is the placebo. But Big Pharma has become wise to this, and sometimes does everything it can to make both the drug being studied and the placebo appear to be similar. Flu vaccines have a special accelerated approval process every year. If each annual flu vaccine had to go through the full three phase trial, it would be available years after it could prevent the current flu variants, making it worthless. So, flu vaccine manufacturers are only allowed to use standard manufacturing techniques that are inspected and reviewed by the FDA. The only change from year to year are the change of the antigens. The new vaccine is still tested for In addition, the CDC closely monitors flu vaccine safety and effectiveness daily. This article was first published in November 2015. Because it’s a cornerstone article for reference purposes on pharmaceutical drug development, I found it necessary to do some substantial copyediting including adding new content, repairing broken links, and fixing some spelling and grammatical errors. I hope everyone finds this article to be useful in countering anti-vaccine arguments and claims. DiMasi JA, Reichert JM, Feldman L, Malins A. Clinical approval success rates for investigational cancer drugs. Clin Pharmacol Ther. 2013 Sep;94(3):329-35. doi: 10.1038/clpt.2013.117. Epub 2013 Jun 5. PubMed PMID: 23739536. Weir JP, Gruber MF. An overview of the regulation of influenza vaccines in the United States. Influenza Other Respir Viruses. 2016 Sep;10(5):354-60. doi: 10.1111/irv.12383. Epub 2016 Mar 24. PubMed PMID: 27426005; PubMed Central PMCID: PMC4947948.